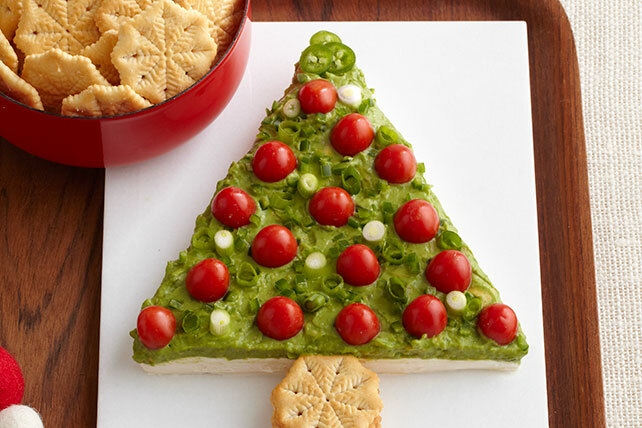 Looking for a fun holiday appetizer? Avocado mashed with mayo and lime juice makes for some lovely greenery on a festive guacamole tree! Cut block of cream cheese diagonally in half. Place triangles together on 12x10-inch piece of plastic wrap to resemble a tree. Cover with second 12x10-inch piece of plastic wrap. Press to flatten cream cheese tree into 7-inch-tall tree with 6-inch-wide base. Peel off top sheet of plastic wrap. Invert cream cheese tree onto serving plate; remove remaining plastic wrap. Mash avocado in medium bowl. Add mayo and lime juice; mix well. Spread over cream cheese. Cut 3 thin slices from pepper; place on top of tree. Seed and chop remaining pepper. Decorate tree with peppers, tomatoes and onions. Place 8 crackers, in 2 stacks of 4 each, at base of tree for the trunk. Serve with remaining crackers. Choose avocados with firm skin that yields to slight pressure when ripe. Once ripe, store in the refrigerator for 2 to 3 days. Avocados are rich in monounsaturated fat, making them a good substitute for foods with saturated fat. If cream cheese gets too soft when shaping it into the tree shape, place it, with plastic wrap, in refrigerator for 5 to 10 min. or until desired consistency. Substitute original RITZ Crackers for the Snowflake Crackers.